The cupboards, fridge, freezer and root cellar are full but my bank accounts are almost bare. True there are a couple of Christmas cheques to deposit but it has been a very rough month. One client messed up on paying me for work done last month and I’m still waiting for the cheque. And the expenses kept rolling in. I’ve had to reach back to my childhood when my mother ruled as queen of the family budget to try and find some tips on getting through this month and into 2012. What I’ve learned is that’s it is only part “hereditary” but a lot of what I’m doing comes from ideas picked up over the years plus using my own skills. A good dose of persistence doesn’t hurt. However, I also found that sometimes yelling out there (read “God “or “Universe” or whatever) for “help” does get positive results. The surprise is, not what I anticipated, but maybe better. Throughout the month I’ve found myself repeating a version of my mother’s budget process – except unlike her I don’t have a partner to consult. It’s only “me, myself, and I” – the trio of one. So, late at night (several nights) I was still up, calculating and re-calculating “income/cash on hand and expenses.” The situation changed frequently with a mess up in my gas bill (twice), two other utility bills arrived (I expected the water but not the hydro until the beginning of January). My business insurance was due January 1 (which means pay by December 31). My glasses payment was due and it looked like what I’d saved for that would have to pay other bills. The list went on and on. I put on my dual consumer/business hat and got to work on the phone, the Internet and e-mail. It turns out the glasses payment is next month – if I’d have known my statement date vis-a-vis the date of purchase, I could have figured that out myself. Some Internet research and a phone call got my business insurance placed on a credit card (payment not due til the end of January). Then I received an unexpected Christmas cheque; a new client (to start work in January), and notice of a settlement, possibly for late January. I still haven’t received the delinquent client’s cheque and I still have a credit card payment (small amount) due later this week. But I’ve learned several somethings. Keeping a positive, but no-nonsense attitude. and following those through with positive action to rectify the situation(s) helps. It doesn’t help to just sit and moan. Sure we have a right to complain but we have to take the complaint a step beyond wailing. Maybe I learned something here from my mother. And perhaps I have another career. Consumer advocate? I do have insights about myself to take into 2012 – persistence and staying positive. Comments anyone? Hope 2012 is better for all of us. Remember the old saying about making lemonade out of lemons. Less than a week until Christmas and the Grinch is making himself known. He’s there in the mall parking lot as shoppers circle around and wait, wait for a parking space. He stands in line at the cash register, making sure something goes haywire (price check anyone?). Can you hear him laughing as some people still argue about what is the politically correct term for Christmas and worse, some offices, etc. are banning Christmas decorations? Check out http://woodlands-junior.kent.sch.uk/customs/Xmas/oldmeaning.htm for some of the craziness in the name of political correctness surrounding previous Christmas years – including a sarcastic politically correct ‘Twas The Night Before Christmas. Christmas time was so much simpler when I was growing up in the 50s and early 60s. I write a bit about this in my memoir. My parents give me a few dollars to buy Christmas gifts. I buy Dad socks or some other dad present and Mom, well, I put a lot of thought into her presents. After I check out the local jewellery store, I drag Dad in to look – not at jewellery – but at a ceramic wall decoration in white with red apples and purple plums painted on the front. But the real joy of Christmas is wrapping the presents. A closed wooden door separates us – Mom at the kitchen table and me at the dining room table. Amid the “pass the scotch tape; now keep your eyes shut,” and the hurried covering of unwrapped presents, we could be wrapping side-by-side. I didn’t realize it then, but it was giving to someone I loved that filled me with contentment. It didn’t matter that the fireplace was electric; or whether Santa existed, when Mom and I wrapped Christmas gifts, we were like one. Dad never helped wrap presents, at least not when I was awake. He probably ate the raisin bread and drank the milk that Mom and I left for Santa. Does it really matter whether we call it Christmas or just a holiday? Does it matter if we equate the Christmas spirit (which many seem to find only in a bottle) with Santa Claus or Jesus Christ or (substitute your own version here)? And please don’t all the Christians ride herd on me for saying that. I may not be big on religion but I do believe in Jesus Christ. My point is that many of us don’t have any Christmas spirit. We stress ourselves out trying to make the perfect Christmas with the perfect gifts, the perfect dinner and the perfect family gathering. Doesn’t usually happen. In short, we become our own Christmas Grinch. First we need to think of what the Christmas spirit means to us and then put it into action. It is not charging around shopping malls at the last minute, but maybe it is helping out a family who has fallen on hard times. Or maybe it is visiting a senior member of your family (or any senior) whom you’ve neglected visiting because you were just too darn busy. Maybe it is opening your home to a friend who would otherwise spend Christmas alone (and maybe you would otherwise, too). To me the Christmas spirit is sharing who and what you are with others, trying to make a positive joyful difference. One of my writing colleagues blogs about random acts of kindness. Check it out at http://50gooddeeds.wordpress.com/2011/12/16/write-by-your-side/ – particularly this post – to get some ideas. I’m trying to adopt some of this. Every time I go out the door, I try to be open to any situation where I can help someone – even if it is only holding a door open or giving someone older than I a seat on the bus…and thanking the bus driver or streetcar driver when I exit. Ho! Ho! Ho! Joyful and happy Christmas to all. Only child and Mom balanced precariously. Not the way to prevent falls. Yesterday I fell when walking down the steps outside a mall. Only the last two steps, and thanks to the extra padding of winter clothes, nothing was twisted, broken or even strained. But I went down cursing and swearing that this should not have happened. I know why it did. Thanks to wearing bifocals, there is a gap between the reading and distance part of my glasses that just doesn’t do depth perception well. I suppose I could have followed in my late mother’s footsteps (literally) when at age 55 she fell while tearing up the basement stairs. She was in a hurry to get from the rec room to the phone in the dining room. Why was she running? Trying to be first to call for a TV contest. (The TV was in the rec room). Within a few weeks we had an extension phone in the rec room. Mom wasn’t hurt – this time. A later fall at age 63 would lead to a brain aneurysm and her death. Some of my previous falls have occurred in the home – again on stairs (padded with carpet), or climbing up on a chair to get a dish from a high shelf. And outside in snowy, icy or slushy weather. One year I fell in the slush while crossing a busy street. I phoned a complaint to my city councillor. A few weeks later when the same mishap on another busy street happened to a younger woman, I gave her my hand and helped her up. Help, especially with yourself, could be a key word for preventing falls this winter, particularly for us older folks. I don’t mean letting someone lead you by the hand wherever you go, but taking precautions. Don’t have time for them? Too busy. Consider a few falling-down statistics. As you age so does your risk for falls. The latter may be a 50-50 risk factor for me, but it’s enough to make you check for roaming rugs and to hang onto the railing of stairs and perhaps look down. I was hanging on to the railing yesterday but perhaps not looking down. Osteoporosis, lack of physical activity, impaired vision (I’d add glasses design to this one), medications, and environmental factors. The latter includes objects on the floors, unsturdy furniture and poor lighting. Outside it could be sidewalk cracks and ice. So what can you do to prevent falls? Get your vision checked often and clean your glasses. Get brighter lighting – something those squiggly-shaped environmental light bulbs don’t do – they provide glare instead. Exercise – walk and/or swim. Keep your walk areas clear of snow and ice (and hope your municipal government does the same for the roads and sidewalks; if not, complain, even to the point of calling up your local TV station with a consumer news flash). Know the main side effects of your medications, especially if you take more than one type. Ditch outdated medications. Talk to your doctor and pharmacist about this. More causes and preventions are on the Colorado State University Extension Website http://www.ext.colostate.edu/pubs/consumer/10242.html. “Fall on your knees” may work in the Christmas carol Oh Holy Night but is not good in your life. At least most churches have padded kneelers and the back of a seat in front to hang onto. Times are tough and everyone, especially those of us who are self-employed, has to stretch his or her creativity to find new areas of work, especially if we fall into the “older” age brackets. Should be easy for us creative types. Well…maybe. But it got me thinking, not just about my underlying skills, but about my late Mom’s. And just how much have I inherited from her? 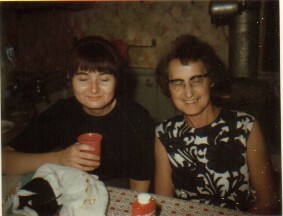 First, Mom, although a widow for six years, never made it to age 65. But she inherited from my dad when he died. Her skill here was financial acumen, something I definitely don’t have except in the area of budgeting. My financial inheritance came early (age 23) and at the expense of my mother’s death. Not really a fair trade. I’d rather have had my mother around a few years more. But on a practical basis, at that age and newly married, much money went into buying a house and later for our son. Later when my husband and I separated, I needed what was left to top up alimony and earnings from my writing for daily living with a growing son. Mom was also great at organizing things. She had files related to her business of living stored in a dresser drawer. I’ve inherited that skill (although no files in my dresser drawers) as well as her attention to detail – both very important for a writer, editor and writing instructor and speaker. She was also a bit of a pack-rat – and so was I until a few years ago when I started the big purge. I still continue in this vein. Less is more. 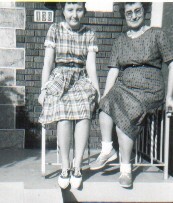 My mother was creative in her own way – we share the gardening and cooking creativity and used to share the sewing one. She made many of my clothes and I made all my maternity clothes and my son’s first sleepers (years ago, but not quite in the grey ages). At that time I also quilted a lot (mostly by hand), something my mother never did. Instead she knitted. I gave up sewing around the time I sold my sewing machine at a garage sale just prior to moving back to Toronto. Now, my sewing is confined to mending…and only “kicking and screaming” about it. But you can’t present yourself to clients, prospective clients, etc. with holes in your clothes or missing buttons. My creativity lies in coming up with ideas and following through with some of them, writing – personal essays/memoir, profiles of quirky people, businesses, gardens, health stories, book reviews, and fiction. I also find it helps when I edit other writers’ book manuscripts. No, not creative editing, but seeing what isn’t working in the story and the possibility for what might work, presented as suggestions for my clients. And as I’ve blogged about before, I love to teach and speak in public. Somehow from being completely tongue-tied and frozen as a teen debating in class, I’ve evolved into someone who likes to get up in front of people and not only provide knowledge, but entertain. Must be the frustrated actor in me. Although Mom wasn’t a teacher per se, she did teach me something by her help and acceptance when I practiced teaching for my grade 8 history class and when I had the audacity to teach her to play the piano – both when I was 13. My point is that in these tough economic times, to find work we need to look beyond the obvious. What hidden skills do we have that we can transfer from parenting, volunteering, hobbies, etc. into ways to earn a living? If we are great at fund-raising for a community organization, can this skill be transferred to promoting ourselves and our work skills? Or possibly teaching others to promote their business. If we have a cooking or baking expertise, can we transfer that into a business? Last month I met another writer on the same panel who is baking cupcakes and plans to turn that into a business. Still stuck? Think about your parents’ skills. Have you inherited any of them? Can you put them to use to expand how you make a living?